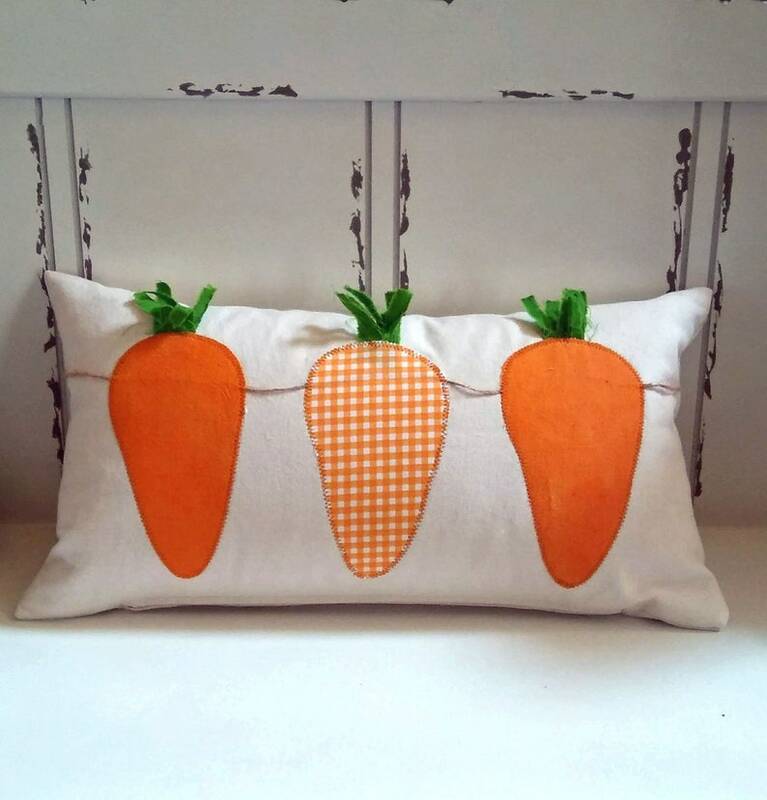 Bright orange carrot applique bunting pillow cover with zipper closure . Order with or without pillow insert. Hand made cotton canvas pillow cover fits 12x22 pillow insert snugly as shown or 12x20 loosely. Solid orange applique is cut from a hand dyed orange cotton fabric and stitched to the natural color canvas with orange thread. Orange plaid carrot is cotton quilt fabric. Carrot tops are green cotton fabric ripped into tatters. Cover has been pre-washed and heat shrunk. Zipper closure on the bottom. Inside the double stitched seams have been finished with a zig-zag stitch to prevent raveling. Applique edges are zig-zagged. **Available with or without insert. **With insert item cost includes the cost of the pillow cover plus the cost of the insert plus the additional shipping required for the insert (above and beyond the shipping for the cover alone). **Slight variations are inherent to hand made items. Turn inside out and wash in cold water using a mild detergent. Do not use bleach. Dry on low-heat setting. Graphic applique will edge fray with washing and drying.